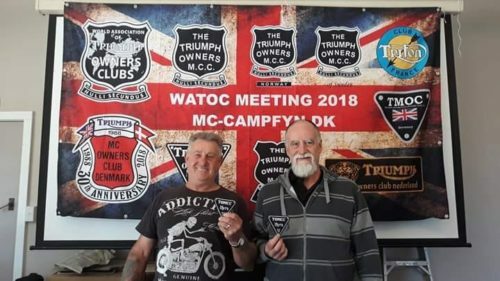 Regional News | Triumph Owners Motor Cycle Club NZ Inc.
Andrew Donovan joined TOMCC NZ in 1996 and his 20 years of membership has been confirmed. Congratulations Andrew. Queens birthday weekend is approaching fast, Eric and Keith are organizing the Mad Farmers ride this year. These rides are generally limited by the number of beds available at the accommodation – usually 20-24 people. Dates are 1st, 2nd & 3rd of June. Neville will contact Eric who will advise the deadline for Waikato/BOP members after which other chapter members may wish to join us. Remembrance ride this year is scheduled for 9/10 November – Ray is organizing, more to follow closer to the date. Next meeting 28/04/19 is being organized by Steve Pou, Neville will send an email with details. Geoff will be in the South island – can Judi organize BOP route to meet the Hamilton crew. May meeting 19/05/19 at Awakino Pete and Steve Rochester to organize, Neville to advise Taranaki chapter and invite them along. June meeting 23/06/19 details closer to the time, Geoff organising. Kerry presented brochures for inclusion along with membership forms in new bike sales satchels at Hamilton Motorcycles for comment. Our newsletter editor, Ken Spall, is assisting with this, thanks Ken, comments back to Kerry by end of this month at the latest. Branding with the bike shop logo was suggested and Geoff and Don to contact Damien at Bayride to ask if they will include the brochure in Tauranga sales as well. It has been suggested that Waikato/BOP host the 2021 National rally, after some discussion it was decided that we would not be in a position to organize the rally but may look at it in future years. All were in favour of the minutes being posted on the website. Also Facebook was discussed and although our chapter has a facebook identity? no one at the meeting is aware of it or use it. Deferred for future discussion.